A visit to Tretower Court and Castle reveals two historic sites for the price of one. In open country against the backdrop of the Brecon Beacons stands a stark, round tower, clearly a military fortification of great antiquity. Its companion piece is a handsome stone manor house which must have served as a very desirable domestic residence in its time. Tretower Castle goes back to Norman times. The great 13th century stone keep surmounts a small mound, this being the remains of Tretower's original earthwork castle built around 1100 to control a strategic route through the Black Mountains. The transition from war to peace is recorded in stone at Tretower. By the early 15th century, the castle had probably been partially abandoned in favour of a new building in the east. In the 1450s, Roger Vaughan began the transformation of this into the glorious house we now see before us, a fine example (rare in Wales) of a substantial late medieval country residence. The galleried courtyard is entered through a stone gatehouse, an arrangement reminiscent of the colleges of Oxford and Cambridge. The gracious life style enjoyed by the favoured few in the Middle Ages is evoked with great authenticity within the carefully restored court. The woodworking is exceptional (and exceptionally well preserved) especially in the gallery with its sliding wooden shutters, and in the hall with its panelled timber partitions. Outside, there is a recreated medieval garden. 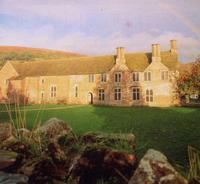 Tretower Court was the long-standing home of the Vaughan family, one of whom was Henry Vaughan, the celebrated 17th century metaphysical poet. Signposted in Tretower Village, off A179. 5km/3mls N. West of Crickhowell.